White Wolf Lodge Yosemite is halfway between Yosemite Valley and the high country within the park, remaining generally un-crowded and retaining a wonderful homey feeling. The sub-alpine meadow where it is located is often spotted with wildflowers. White Wolf Lodge Yosemite National Park is off the Tioga Road, approximately 30 miles from Yosemite Valley. Take California Highway east from the valley toward Tioga Pass and watch for signs. The Lodge is the perfect place to begin some hiking adventures. The Lukens Lake Trail is a one-way, 4-mile hike from the White Wolf Campground to this beautiful lake that forms the headwaters for the Middle Fork of the Tuolumne River. You can swim and fish here. The Harden Lake Trail takes you through pine forest and along the Middle Fork of the Tuolumne River to the popular fishing and picnic spot of Harden Lake. This hike is 6 miles out and back. Get a spectacular view of Yosemite Valley and Half Dome from this viewing area. You’ll find a number of hiking trails around this beautiful lake, surrounded by granite cliffs worthy of extensive photographing. John Muir Trail can be accessed from this gorgeous meadow, and you’ll find some breathtaking views as well. 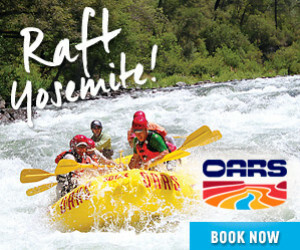 Travel about 40 minutes to reach Yosemite Valley, with its hiking trails, views and convenient facilities. Be sure to stop at the visitor center. 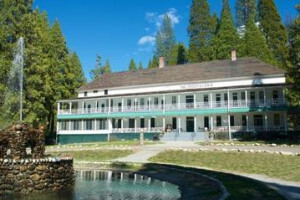 Yosemite White Wolf Lodge is typically open from early July to mid-September, depending on the weather conditions. Actually, White Wolf Lodge is not a lodge in the traditional sense, but a number of cabins, consisting of twenty-four canvas tent cabins and four wood-sided cabins. The wood cabins each have a bathroom and resemble a standard motel room, with a porch and chairs so you can relax after a day of adventures. You’ll have daily maid service and linens are provided in the cabins. The canvas-covered tents have wood frames and sit on a wooden platform. They accommodate up to four people and have linens provided, a wood burning stove and wood. There is no electricity, but you will have candles for light. Relax on the benches outside and admire the fresh air and night sky. Centrally located bathrooms are convenient for guests. White Wolf Lodge also has a restaurant and a small general store. Reservations can be made at the White Wolf Hotel Lodge by calling 888-413-8869 or Book Online.